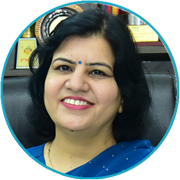 Telephones : +91 522 - 2418425"
It gives me great pleasure to greet all students, parents and teachers. Children are the most valuable resource of any country. The mind of a child is tender and fresh; it can be moulded as we want. At a tender age, we nurture these young ones with love and care so that these innocent minds become high achievers in every sphere of life in later years. We endeavour to make our students realize their potential. Teachers at our branch create a positive learning environment which helps to optimize the students’ learning and makes it possible for students in the classroom to feel that they are destined for greatness. 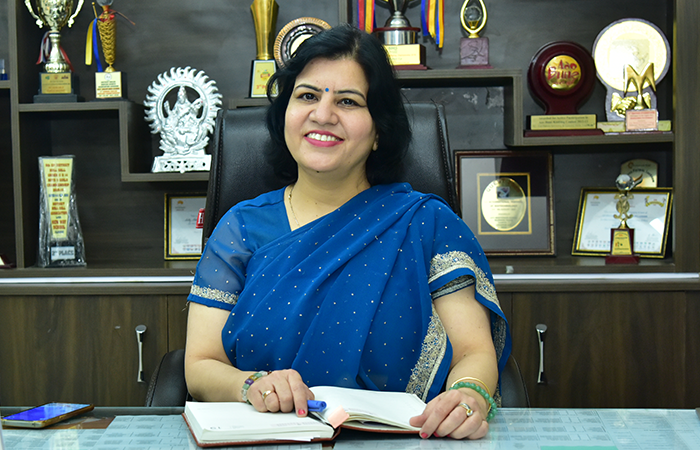 Rajajipuram Campus II stands out like an oasis, spreading knowledge through education in all directions under the careful leadership of its Principal Ms Shipra Upadhyay. Rajajipuram II started in the year 2002 and today it has a large number of students being nurtured under the guidance and care of its Principal. I take immense pride in stating that this year we had our first Inter Campus Roller Skating Competition where we saw immense talent being unfurled. Our students, with the grace of God have not only performed well, academically, but also have won laurels in various inter house and inter campus co-curricular activities. This session also added jewels to our crown with the student of Class III, Udyansh Shandilya winning the Champions Trophy in UC Maths ABACUS 2017. Akshay Tripathi of Class VIII was awarded a bronze medal in WIZMIC International. Yashasvi Gupta and Agrima Srivastava of Class VIII bagged merit certificates in INDIA International Mathematics Competition. Daksha Singh and Shivanshi Srivastava also won second and third position in 5th District Chess Championship, thus adding to the laurels of the campus. With the unstinted efforts and eagerness for constant improvement in teaching methods and with the cooperative strength of parents, the Campus is constantly treading ahead on the path of continuous progress. I thank my dedicated teachers and the staff who are always ready to nurture the tiniest little bud into a flowering plant of talents. I am immensely thankful to the CMS Management for their guidance and support in all our activities and endeavours. Students of Rajajipuram Campus II has won the laurels in Wiz National Spell Bee Inter School Competitions. The names are Pranav Pandey(4th Rank), Akul Srivastava(2nd Rank), Udyansh Shandiya(2nd Rank), Darsh Prashant(6th Rank), Yashashvi Gupta (9th Rank). Three of them are selected for State Oral and written round. They have been awarded with cash prize, medals and certificates. The branch believes in academic excellence and perfection in all activities. The little ones are taught in a very interesting way based on the principle of "Learning is Fun". 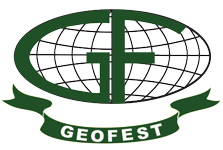 They are trained to develop good oratory skills and excellent writing abilities. Several students of the branch have been awarded gold and silver medals in various competitions. Model class presentations, special assemblies, extempore speech and debate contest give them opportunities to polish their oratory skills. The various inter house competitions and prayer assemblies held at the branch, over the years, created a congenial environment and provided the children an opportunity to exhibit their talents in recitation, speech, music, dance and dramatics. Our branch bagged the runners us trophy at the Inter Branch Human Rights Day Competition indicating the high quality of education along with the creative and literacy skills that we instil in our students throughout their stay at the branch. The branch has always had teacher who are trained and have excellent academic record.